We explore the technologies and companies that transform data into insights that lead to informed action. We’re especially interested in data from social media sources, but we’re not limited by arbitrary boundaries. If a new data source or analytical approach promises to create value for our clients, we’re interested. We track the market for social media intelligence, from emerging technologies to evolving market segments. Our view is international, cross-functional and industry-agnostic. We notice the specialists and the generalists, and we’re interested in what they do and how they describe themselves. We collect industry news at the only dedicated site in the space, Social Media Analysis. Our annual review of mergers and acquisitions is a convenient summary of last year’s activity, while our M&A scorecard shows everything from 2007 to today. 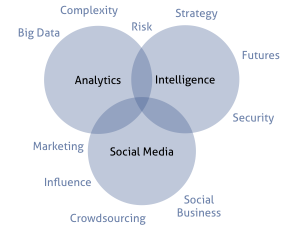 We cover three major themes: intelligence, the discovery and analysis of useful information and opinions; analytics, the quantitative view of the world, both physical and virtual; and social media, the universe of Internet-based communication channels and communities where people and organizations share and interact globally. Precise definitions don’t matter, because we’re interested in all of these, how they interact, and adjacent spaces that may become relevant. In 2006, Social Target was formed to explore the new industry that was forming to monitor and analyze online conversations in social media. The Guide to Social Media Analysis (2007) was our first report, profiling 31 companies. The second edition (2008) grew to 63 companies. In 2011, we launched a free company directory at our industry news site, Social Media Analysis. The directory now features more than 500 companies worldwide. Social Target is the only research firm with a consistent interest in the social media analysis (SMA) market since 2006, and SMA remains a core topic for our advisory and consulting services.